Who Could The Winnipeg Jets Take Ninth Overall In 2014? While three teams are focused on bringing home a Stanley Cup victory in the coming weeks, there’s 27 others who are preparing for June 27th; The NHL Draft. When that day comes, the Winnipeg Jets will look to add another pivotal piece to their puzzle with their first selection; something they’ve had success doing since moving from Atlanta in 2011. Mark Scheifele (selected 7th overall in 2011) and Jacob Trouba (9th overall in 2012) are both cornerstones for the Jets franchise coming off of stellar rookie seasons. Last year they selected defenceman Josh Morrissey with the 13th pick, who put up 73 points in 59 games in the WHL, before being promoted to the Jets’ minor league affiliate, the St. John’s IceCaps. Clearly, General Manager Kevin Cheveldayoff’s strong suit thus far has been his eye for talent come draft time. Luckily for him, this year’s draft pool is seemingly loaded with talent, especially when it comes to the winger position. Since the team has selected a defenceman with their top pick in the last two drafts, expect the Jets to add a difference maker at forward with the 9th overall pick. Here are some of the most notable wingers that could become core pieces on the Jets for years to come. The NHL only saw seven Danish players take the ice last season, but that doesn’t mean Denmark isn’t capable of producing top-level talent. Not many Jets fans would complain if the team selected winger Nikolaj Ehlers with the 9th pick in the draft. 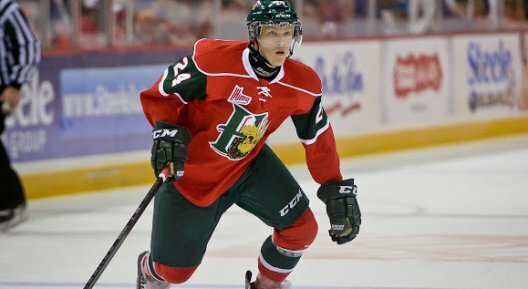 Ehlers had a monumental year playing for the Halifax Mooseheads of the QMJHL but also played a huge role in Denmark’s first place finish at the Division I World Junior Hockey Championships. As a result of going undefeated in December’s tournament, Team Denmark will be playing in the top division come 2015, thanks in no small part to Ehlers. The undersized winger (5’11, 176 lb) was tied for ninth in scoring throughout the tournament with 6 points (2 G, 4 A) in 9 games, as well as being an impressive +6. Not many more players stood out quite like as Ehlers did in his rookie season in the QMJHL, either. He won the RDS Cup (rookie of the year) and Michael Bossy Trophy (top professional prospect) last season and deservedly so. He had 49 goals and 55 assists (104 points) in 63 games. He’s been compared to the likes of Patrick Kane and Martin St. Louis due to his small stature, which he makes up for with fluid skating and exceptional playmaking abilities. The Jets definitely don’t lack grittiness with players like: Andrew Ladd, Evander Kane, and Dustin Byfuglien up front, so maybe a speedy offensive threat like Ehlers would be a perfect fit. Another possibility for the Jets at #9 would be to pick up a physical forward who models his game after Rick Nash. 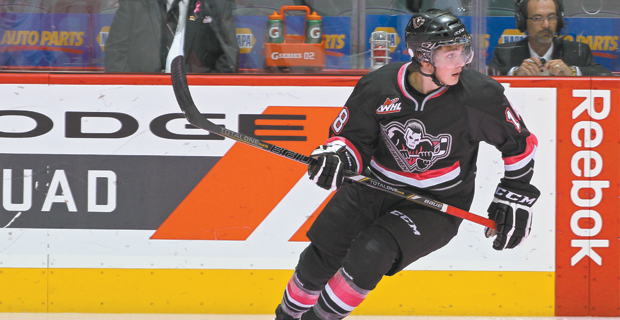 That player is Calgary Hitmen’s Jake Virtanen. If the team decides that either Dustin Byfuglien or Evander Kane aren’t part of their long term plan, then they may look to replace their tenacity and scoring streak through the draft with a player like Virtanen. At only 17-years-old (18 in August), Virtanen is already 6’1 and weighs 208 pounds. Not only does he have a frame similar to Rick Nash, but he has the same skill set when it comes to being able to put the puck in the net. His shot is lethal, and it showed on the stat sheet last season, as he scored 45 times in 71 games for the Hitmen (7th in the WHL). His biggest weakness, however, is his skating, but that’s something that can be improved on with proper coaching and more experience. Those who watched Dustin Byfuglien’s rookie season with the Chicago Blackhawks know that it’s important to be patient when it comes to a big framed player getting more comfortable with their skating. Since Virtanen is still so young and raw, it may be a while until he suits up for an NHL team; but his size combined with disciplined defence and a quick shot may help him wind up in the big leagues sooner rather than later. If you want a more accurate comparison to Dustin Byfuglien, look no further than Peterborough Petes’ Nick Ritchie. If Big Buff leaves Winnipeg this offseason, and the team wants to draft “Big Buff Lite” then they will have their eyes set directly on Ritchie. The 18-year-old who put up 71 points in 64 games is like a big ball of clay just waiting to be moulded into a dynamic power forward at the next level. Standing at 6’2, he doesn’t have the height of a Dustin Byfuglien (yet), but the Orangeville, Ontario native clocks in at a whopping 226 pounds. Some teams may look at his weight as a red flag; a sign that he will be too slow or too poorly conditioned to be worth a high draft pick. 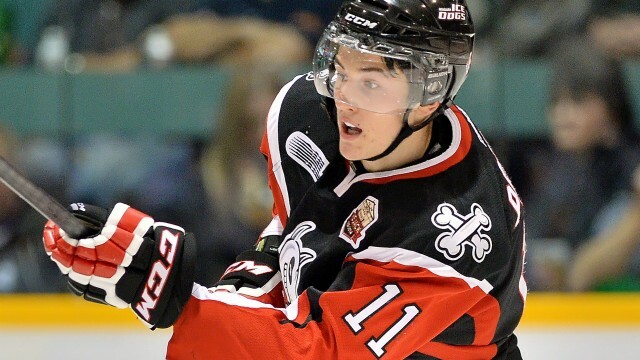 The thing to remember with Nick Ritchie, is he will be a project player for whoever drafts him. Ritchie is an intimidating player, who’s not afraid to throw a check or drop the gloves (3 fights last season), but his offensive game can be somewhat inconsistent. But there is still tonnes of promise in his game, since his inconsistency mostly took place early on in the season, and his point production improved drastically as the season progressed. He scored only 3 points in 6 games in December, but was able to light a fire under his skates and tally 20 points in 11 games the following month. If the Jets want to add another intimidating forward with a big shot and even bigger hips, then Ritchie would be a good value pick if he falls to #9. Perlini would be a “safe pick” at #9 since there is no glaring weakness to his game and he skates much better than the likes of Ritchie and Virtanen. The risk the Jets would take in selecting the 17-year-old stems from the fact that he’s only had productive season in the OHL. Before posting a stat-line of: 34G, 37A, 71P in 58 games last season, Perlini only had a total of 12 points in 59 games the previous year (he spent his first 32 games with the Barrie Colts). It seems there’s no “wrong choice” for the Jets at #9, but like every draft, whether or not they make the right decision won’t become apparent until several years down the road. These four players could all be all-stars as easily as they could be career AHLers; but with the Jets recent track record in the draft, it’s hard not to be confident that whoever goes ninth overall will one day contribute at the next level. Who Would You Like The Jets To Draft?